Happy Earth Day! Did you do anything today to honor the earth? 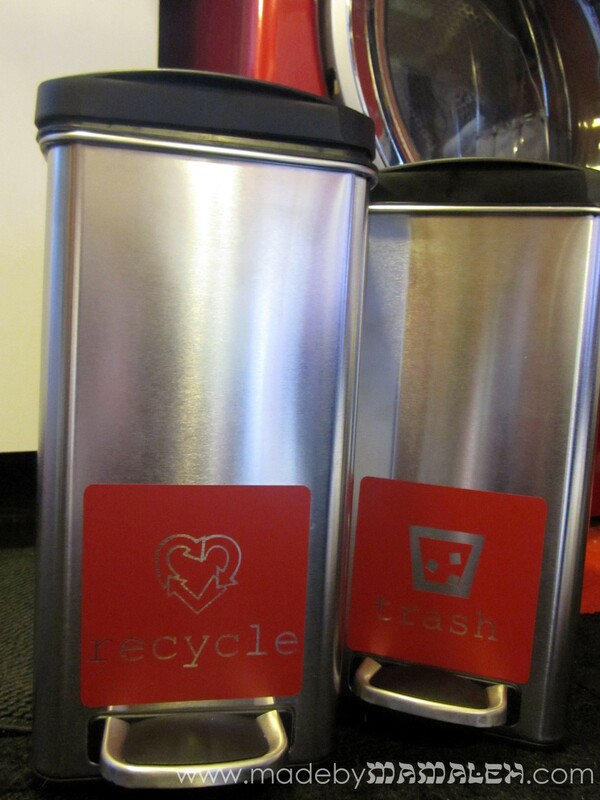 Take advantage of any of the fun Earth Day giveways out there? I decided to finally label our laundry room garbage and recycle bins. Here in Seattle, there are so many bins to choose from- we have a bin for garbage, one for recycling and another for compost/yard waste. I’m proud to say our garbage is the smallest can of all. But, it can get confusing for guests to know what to put where. So, I’ve been meaning to make labels for a while now. 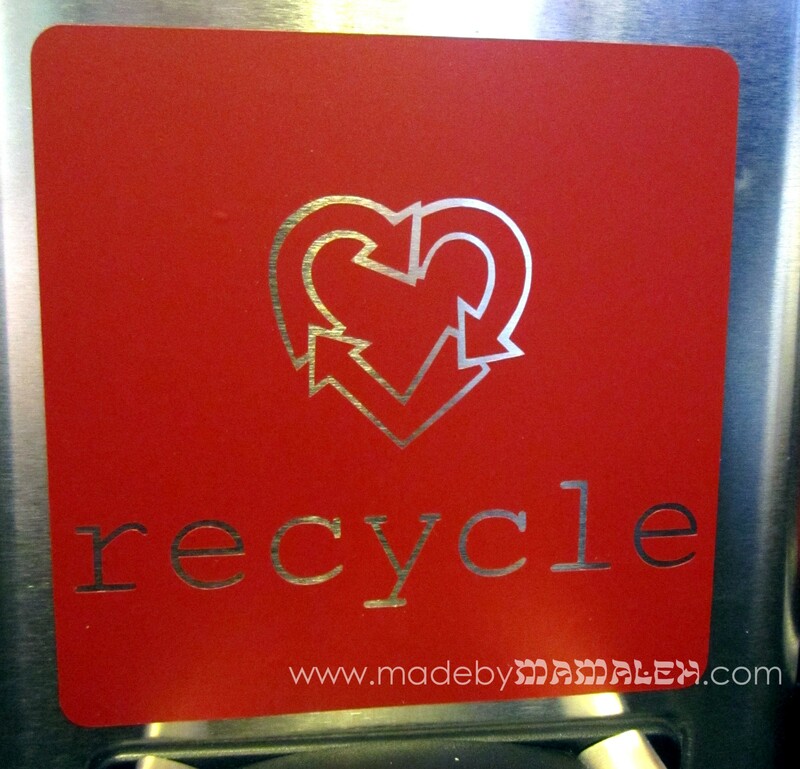 I created some cute labels using Silhoutte Studio and then cut them out on red vinyl using my Silhouette Cameo and then, (after giving the cans a little buffing using stainless steel cleaner), I applied them. I love the result! They look great next to our red washer and dryer. What do you think? Want some for yourself? I will send one lucky person a set of your very own trash/recycle vinyl labels in your choice of white, black or red to help put an end to your guests’ trash confusion. In order to enter this giveaway, just leave a comment below. And you can enter an extra time for each of the following (just leave a corresponding comment for each additional entry): 1) Follow Made by Mamaleh via email; 2) Follow Made by Mamaleh on Facebook; 3) Post a link to this giveaway on FB. Comments must be received by midnight (PST), Wednesday April 25th to be entered to win! The sun is finally out in Seattle and it’s feeling like spring. I generally change the welcome sign by our front door with the change of seasons/holidays but the only one I have a with a Jewish flare is a “Happy Hanukkah” one. So, I decided I wanted to do a simple Shalom (shalom is Hebrew for peace and also a greeting of hello). 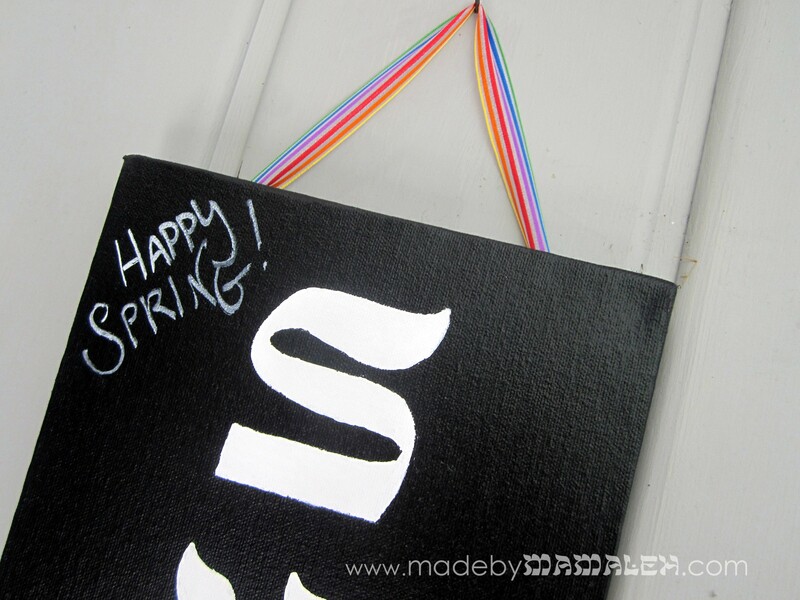 I started with an 8×24″ canvas and a can of chalkboard spray paint. Then, using my Silhouette Cameo cutting tool, I designed the word “Shalom” in the “Sholom” font in Silhouette Studio to fit the dimensions of the canvas. 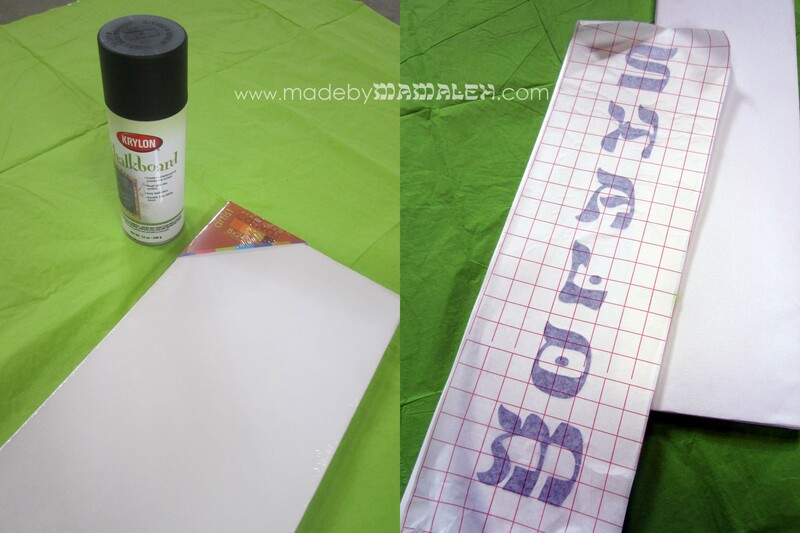 Next, I cut out the word in vinyl to use as a reverse stencil on the canvas. Adhering the vinyl directly to the canvas proved a bit tricky so I ended up spraying a coat of primer first just to give it a bit more to grip to. 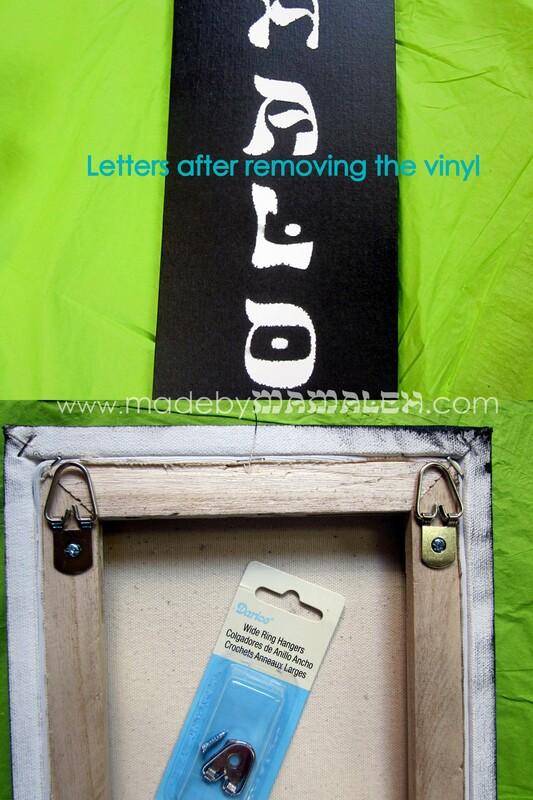 Even then, it took a lot of patience to stick the vinyl letters to the canvas. Once you have them in place, you just have to make sure they are really pressed down in order to minimize paint seepage. Then it was time to spray the chalkboard paint. 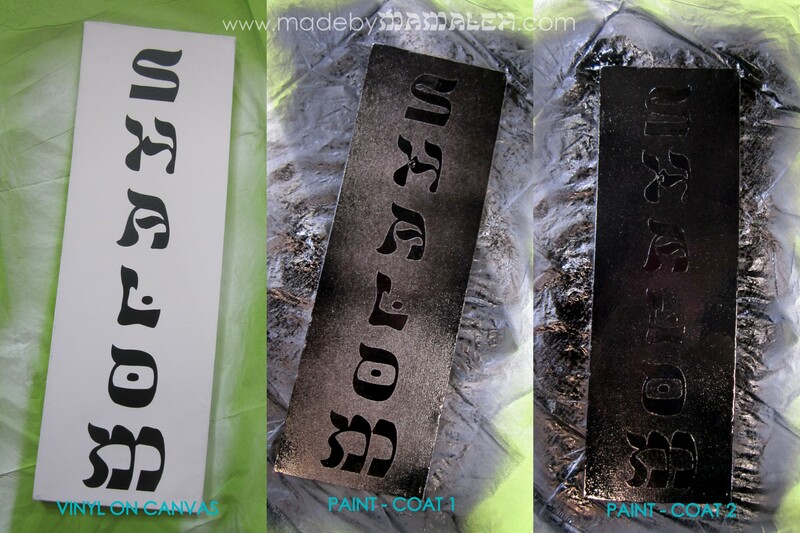 You need two coats to get a good chalkboard surface. After the paint dried, the next step was to carefully remove the vinyl letters. The edges were a little uneven and I could have left it for a rustic look but decided that I’d be happier painting over the letters with white paint to clean them up a bit. I also attached some hanging hardware to the back so that I could attach a ribbon for hanging. And if I ever wanted to move this indoors and put it on the mantel, you could do that too because the hardware is hidden in back. The beauty of this is that I can now change out the ribbon to fit my mood the season(can’t wait to use my matzoh ribbon for Passover!). Hope you are out enjoying some sunshine!